In North Carolina, roughly 32 people die unexpectedly every day, their loved ones devastated not only by loss but the inability to say goodbye. To help prevent these tragedies, UNC cardiologists examine death certificates, medical records, and emergency medical services data to determine which populations are at risk of sudden death, and why. A man in Phoenix, Arizona, calls his mother in Columbia, South Carolina, every Sunday at 6 p.m. — a 20-year-old ritual as sacred for them as Sunday morning church service. For two decades she never failed to answer her phone. On a Sunday just before Halloween in 1999, her phone rings and rings and rings. No answer. A few days later, in South Carolina, EMT Sean Kaye responds to a strange call from the local emergency medical services dispatch center. “They told us not to use our lights or sirens,” the paramedic explains. “Well, we always use our lights and sirens, so we found this really bizarre.” He and his partner arrive at a house built in the 1960s. They sit and wait. Ten minutes later, a cab pulls up to the curb and a 50-something man gets out of the car. He explains the weekly phone calls, her medical problems, her heart condition — and that he doesn’t have a key to her house. This is not an issue for someone like Kaye, an experienced EMT who’s been locked out of homes before. He kicks down the door. Entering the dark house, he feels around like he’s blind-folded, trying to get his bearings. Upon reaching the back bedroom, he finds the man’s mother in her bed. 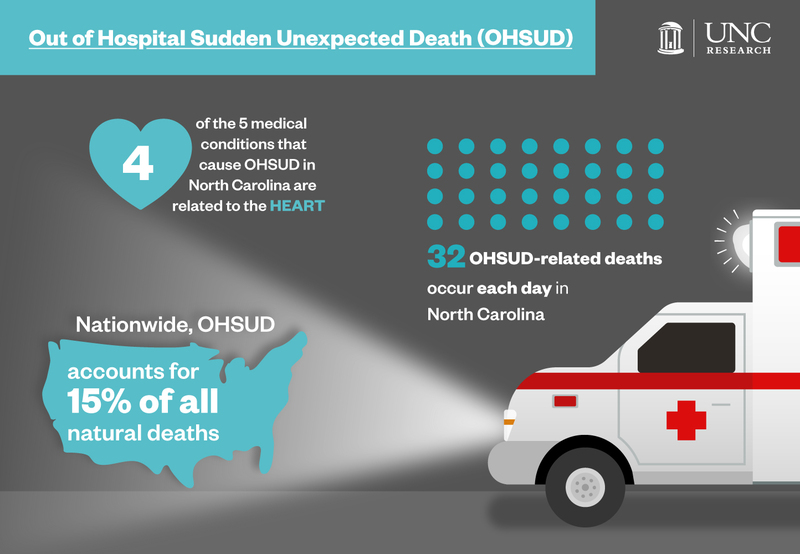 In North Carolina alone, approximately 32 people die each day from out of hospital sudden unexpected death (OHSUD). The narrative above is not uncommon, and the family and friends left behind are almost always emotionally overwhelmed. In the United States, OHSUD accounts for approximately 15 percent of all natural deaths according to UNC’s SUDDEN Project. Founded in 2012, the study is dedicated to surveillance and prevention. Since the project’s start, the SUDDEN team has identified five medical conditions that lead to sudden death in North Carolina, four of which deal directly with the heart: high blood pressure, diabetes, high cholesterol, coronary heart disease, and cardiomyopathy — a hereditary disease of the heart muscle that makes it difficult for the heart to deliver blood to the body. Computers equipped to electronically filter death certificates help SUDDEN researchers determine potential cases that could be characterized as OHSUD. The software collects data by county and calendar year, and filter information by age, location of death, and manner of death. Deaths due to cancer and drug overdoses are not included. Clinical data is abstracted from the subject’s medical records to inform prevention efforts. What is sudden unexpected death? A malfunction of the heart that results in a rapid loss of blood flow through the body, leading to death. It happens immediately and may have few or no known warning signs. The SUDDEN team hopes to, ultimately, identify risk factors for OHSUD so they can initiate prevention strategies in high-risk communities. In truth, sudden unexpected death affects all of us. It’s similar to suicide, in that most of us know someone who’s passed suddenly. People who live in poverty, though, are affected more, according to Mounsey. Using data from the U.S. Census, he and his team have demonstrated that people with the lowest household income are much more likely to die suddenly. Habitual drug users who don’t overdose, as well as people with mental health problems also have an increased risk of passing unexpectedly. For OHSUD victims with access to health care, many abstained from taking their doctor-prescribed, preventative medications. “This was a surprise to us,” Mounsey says. “Especially with people who had medical records. With those cases, we knew if they had high blood pressure or coronary artery disease or whatnot — and they weren’t always taking the recommended medications to prevent something like this from happening.” Approximately 50 percent of the OHSUD population passed because they didn’t take their prescriptions, according to Mounsey. “We’ve been collecting data for a year or two now, but we need so much more to prevent sudden death victims from dying,” Jason Stopyra says. The medical director of emergency services in both Randolph and Surry counties, Stopyra leads the intervention and prevention components of the project in those areas. Most recently, he and his team of paramedics attempted to reach the recently deceased as close to their time of death as possible to perform echocardiograms — a test that uses ultrasound waves to produce a visual display of the heart. SUDDEN study researchers have teamed up with emergency service groups in Wake, Surry, Randolph, and Orange counties, as well as epidemiologists at the UNC Gillings School of Global Public Health. “Epidemiologists understand how to take very diffuse data you get from looking at patient records and then make scientific deductions from it,” Mounsey says. Carolina Demography is also helping to identify which populations the team should study. The group has a collaboration with the Environmental Protection Agency, too. “It has been known for a long time that periods of high atmospheric pollution are periods when people die suddenly,” Mounsey points out. London’s Great Smog of 1952, for example, killed 4,000 people and made 100,000 more ill. The catastrophe occurred when a period of cold weather and windless conditions combined with pollutants created from burning coal to form a thick, seeping layer of smog that swept across the city. It lasted for four days and led to the Clean Air Act of 1956. Today, the SUDDEN team analyzes death certificates in North Carolina and plan to expand to South Carolina and Georgia. As electronic medical records continue to grow, they hope study more places across the United States and eventually automate the analysis process. “If we can provide states with an automated method to pull death certificates and query medical records electronically, we can show them where the hot spots are for unexpected death and who in their population is vulnerable,” Mounsey explains. That’s why Mounsey feels he and his team need to continue to push the message of good primary care out into the population. “How do you deliver this message to the people who need to hear it?” he asks. In Surry County, they’ve developed a prevention task force comprised of the county health director, hospital case managers, community health workers, emergency services staff, and veteran service organizations. “We want to figure out how we can work together to identify gaps in care and prevent sudden death across the county,” Pursell says. Paul Mounsey is the Sewell Family/McAllister Distinguished Professor of Medicine in the Division of Cardiology within the UNC School of Medicine and co-principal investigator for the SUDDEN Project. He leads the cardiac arrhythmia and electrophysiology service. Ross Simpson is a professor of medicine in the Division of Cardiology within the UNC School of Medicine and principal investigator for the SUDDEN Project. Irion “Chip” Pursell is a registered nurse, the clinical manager for the Division of Cardiology within the UNC School of Medicine, and co-principal investigator for the SUDDEN Project. Sean Kaye is an EMT-paramedic and the EMS specialist in the EMS Performance Improvement Center within the UNC Department of Emergency Medicine. Jason Stopyra is an emergency physician, medical director of emergency services in Randolph and Surry counties, and an assistant professor in the Department of Emergency Medicine at the Wake Forest Baptist Medical Center. He is leading the intervention/prevention initiative for the SUDDEN Project.